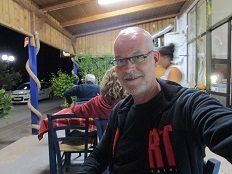 This is quite a large taverna on the seafront promenade of Sitia. 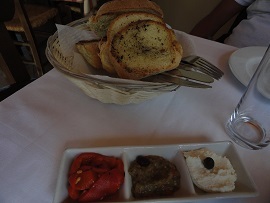 We order a cappuccino and a dish with a variety of snacks. 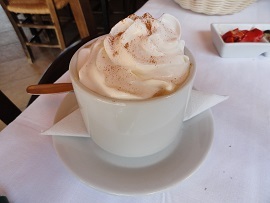 The cappuccino is served with whipped cream instead of milk. 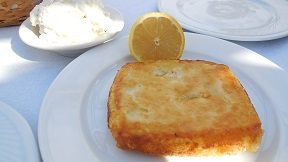 Nice is the toasted bread with garlic and a dish with several small things that you can put on your bread. 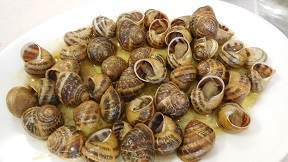 It takes a while before the main course appears on the table and even longer if we want to pay the bill. 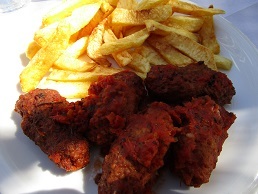 The food is not bad and it is not expensive. 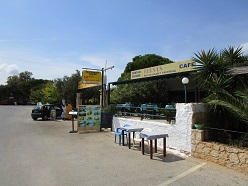 The restaurant in Sougia on the corner of the main road / entrance to the village and the beach. 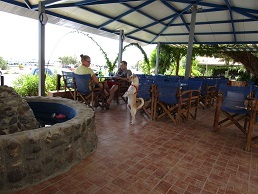 There is a very extensive menu to choose from and you can have breakfast, lunch or dinner here. 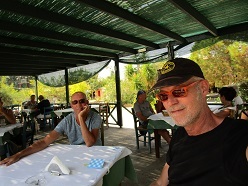 We have had quite a few meals here. 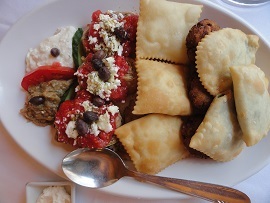 On ur last visit we tried the Galini salad (which is fun - with a little bit of everything), the saganaki (fried cheese) and the chicken nuggets. 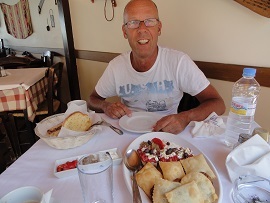 Nothing to complain about, straight forward Greek food, nice portions. The only downside is the cappuccino with too much milk and not really hot. 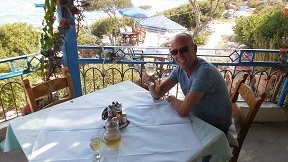 At our first visit we just had a cappuccino here but it was tip top. 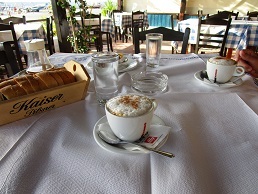 They had Illy coffee and the cappuccino was made with hot milk. 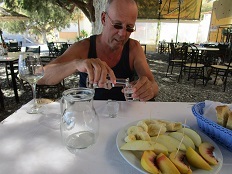 It was strong and good and it came with cookies and a glass of cold water. The price was good as well. 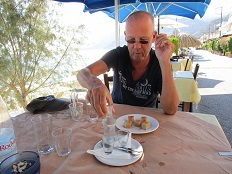 In the following years we have returned several times, usually only for a cappuccino, but sometimes for a snack. 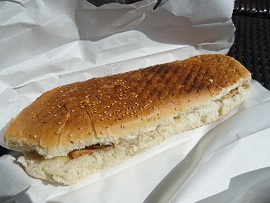 The chicken sandwich, cheese, tomato, bacon is a must: warm, tasty, great and very cheap. 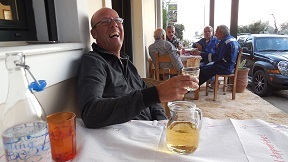 The service is very friendly (a lady) and the toilets are clean, with a soap dispenser and automatic paper roll. 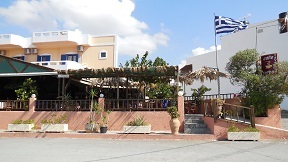 Elena's Restaurant is located on the square at Stavros beach. 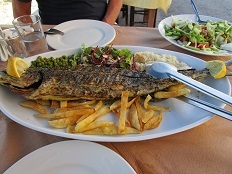 We ordered the grilled sardines, the Greek salad, the dorade (fish), fries and half a liter of white wine. Extremely friendly and quick service. All the food we ordered tastes fine. A thumbs up. 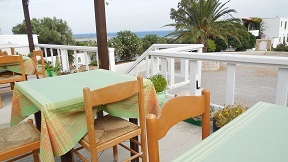 The Tersanas Taverna is located near the beaches of Tersanas. 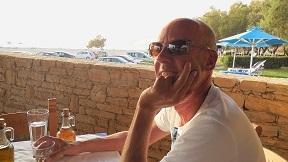 It's a nice place with a nice view of the bay and beaches. 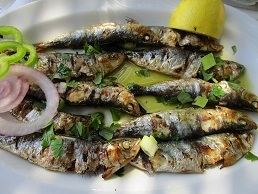 You can order seafood, but also other Greek dishes. 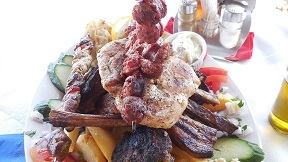 We order the Tersanas salad and the meat platter for two. 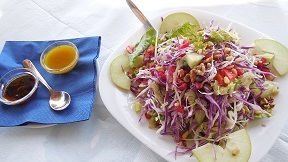 The salad comes with two different delicious sauces, the service is friendly. 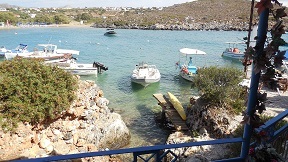 At the beach of Tertsa there are 3 tavernas and also one more on the right side of the street that leads from the sea into the village. 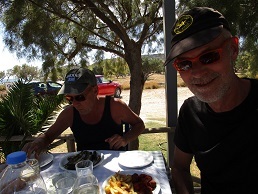 To us Taverna Lambros had been recommended. 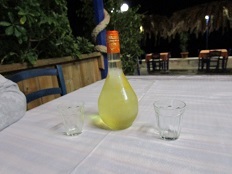 This taverna is named after the son of the owner. 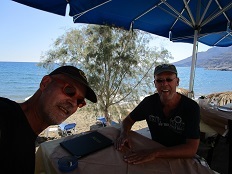 We got the impression that all the other tavernas were a bit ignored by the locals and the tourists. 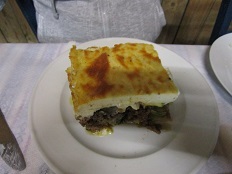 Everyone wanted to eat Lambros and there were even people from villages around Tertsa that came to this taverna because it is so good. 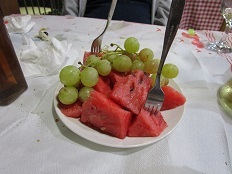 In fact, the days that we stayed at Tertsa we have only eaten here, because it was great: delicious food and nice people. 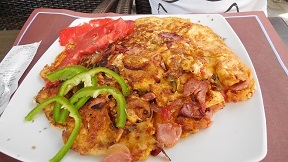 You can not only have lunch and dinner here, but they are also open early in the mornings for breakfast. 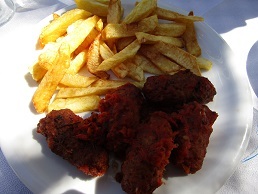 The dishes are spicy and have much flavour. 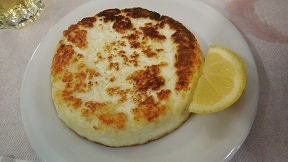 We have therefore tried everything: spinach-cakes, feta saganaki (fried feta cheese), lamb chops, shrimp saganaki (flambéed shrimp) and green beans. 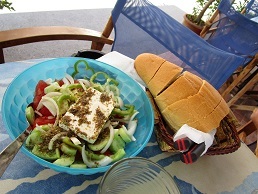 The Greek salad consists of tomatoes, cucumbers, peppers, an outing, olives, feta and herbs. 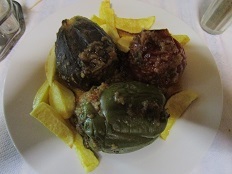 At Lambros they use fresh products and herbs. The bread is nice and fresh too. 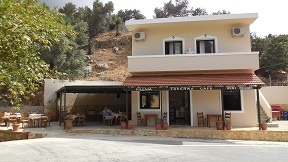 The Filenia tavern is situated on the route of Akoumia to Triopetra beach, about two kilometers from the beach, right next to a natural spring. 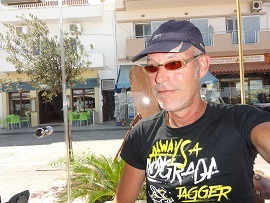 It is run by the extremely friendly Antonius and his wife. 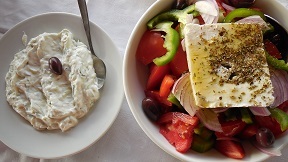 Here the Greeks themselves come to eat, and that is not surprising, because the food is excellent. 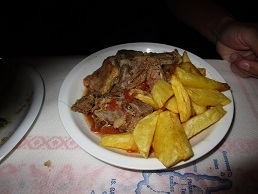 In Filenia there is not a very big menu and the number of dishes offered is limited, but there are original dishes on it and everything is prepared with care. 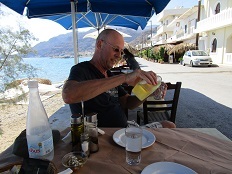 We have eaten here several times and plan to definitely come back on the next visit to Triopetra. 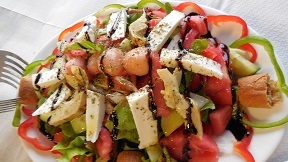 We already have tried several salads, "Sfaka pie" with honey, artichoke hearts, tzatziki, a delicious saganaki (fried cheese) and snails. 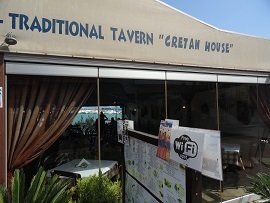 This tavern can be found on the beach of Triopetra. 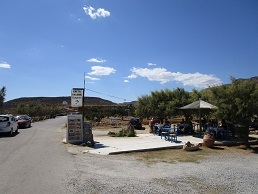 It is a kind of tavern where you can notice that they only focus on the accidental tourists that are there and that want something to eat. A dime a dozen we call it. It's not bad but it's also not special. 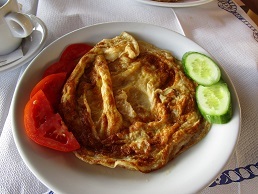 We try tzatziki (nice with plenty of garlic), the saganaki (could be better), Greek salad (made without any fantasy) and a special omelette with ham, onion, pepper and tomato, with cheese on top (which tastes of nothing). 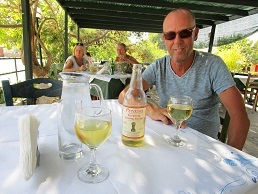 The house wine is a retsina and tastes good. 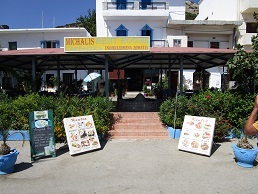 Marinela Café Snack Bar is one of the two taverns in the village of Tris Ekklisies. 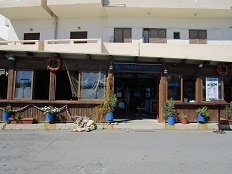 Both taverns are located on the beach and directly next to each other. 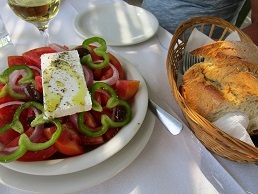 The other taverna is called Café Vagelis, but you can also eat something there. 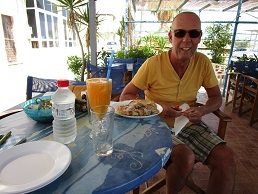 We only ate a few times at Marinela. 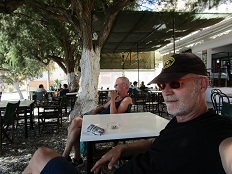 It is on a corner and the chairs are under tamarisk trees, so you can sit in the shade. 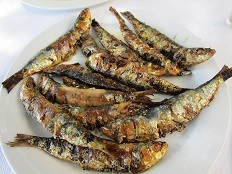 I have eaten the tastiest sardines ever and also the dorade fish we ordered there was very good. 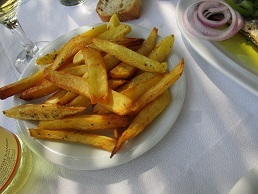 The fries are also very tasty and crunchy. 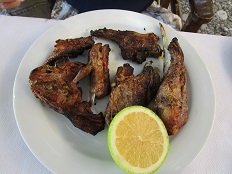 The lamb chops were a little disappointing compared to the fish. 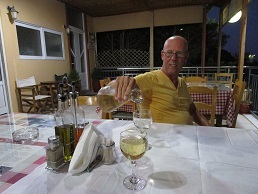 The wine was also very good. 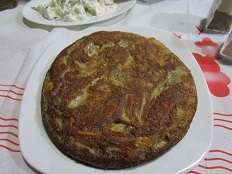 Marinela is very friendly and a fantastic cook. 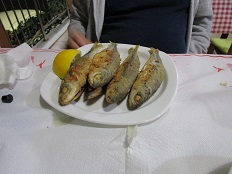 Our verdict: a 10 for the fish, an 11 for the sardines and a 7 for the lamb chops, on average a good 9. 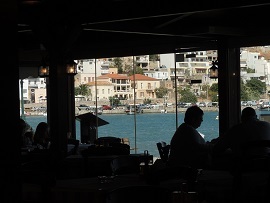 Zorba's is located on the seafront, a little bit at the end (east). 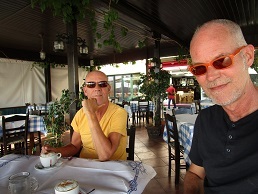 We have actually just ordered a cappuccino. 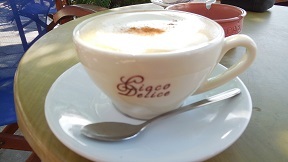 This was very nice, large cup of coffee, warm, with whipped milk and a it was served with a bottle of water. Just exactly as you want it. 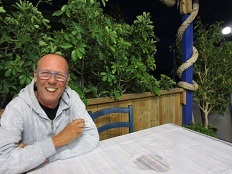 The service was also very friendly. In 2017 we were back and we also had dinner here. 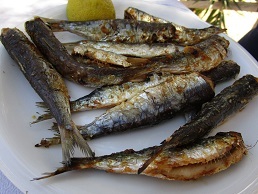 We ordered the sardines and the goat in the oven. 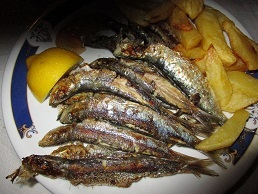 The sardines were very good, the goat could have been more tender. 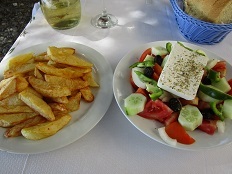 The French fries and the Greek salad were okay. Service was still wonderful and friendly. 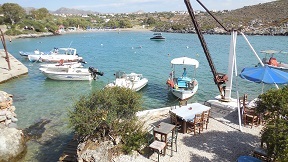 Inatos is situated near the harbour in Tsoutsouros. 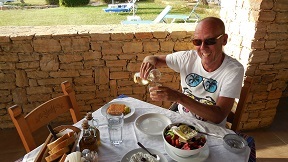 Here we had breakfast (8 euro per person 2017). 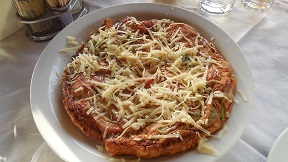 One of the things served was an omelette. De coffee was good and the bread was fresh. 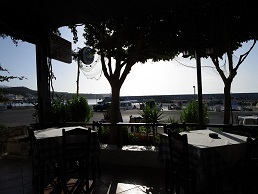 This tavern is also located in the harbor of Tsoutsouros. 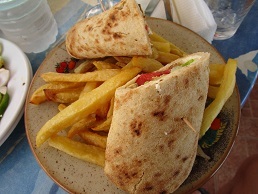 We order the Greek salad, a crepe with bananas and chocolate, a pita giros with chicken and fries and a fresh orange juice. 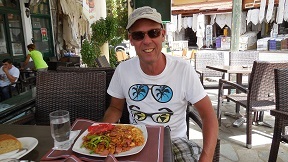 The portions are big, the food is tasty and the service is very friendly. 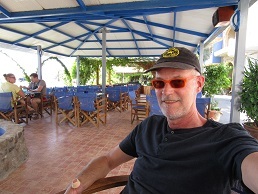 This tavern is located at the western beach of Tsoutsouros at the wonderful accommodation where we also stayed a couple of days. 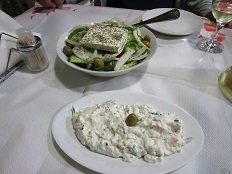 We ordered the tzatziki, a fish plate, a Greek salad and French fries. 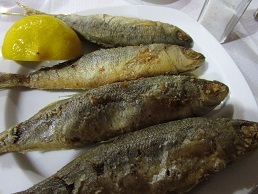 All dishes taste very good, especially the fish (and really cheap, only 5 euro in 2017). 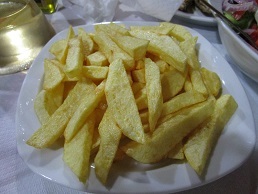 The fries are crispy and the wine is good as well. 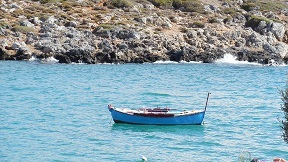 The owners are extremely hospitable and friendly. 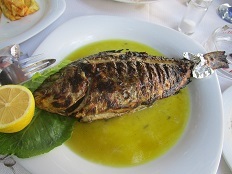 Sarakina Fish Tavern is located on Tsoutsouros Beach. 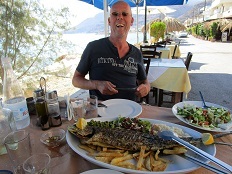 On Tripadvisor this restaurant gets pretty much the best reviews of all the eateries in the village. 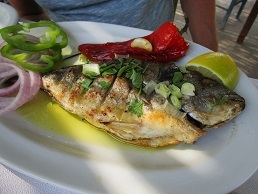 We order the tzatziki, the Greek salad, the house wine and a "lambouka" fish. Everything is fine, including the friendly service. 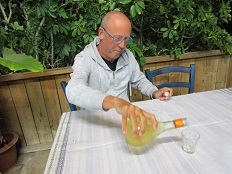 The house wine tastes very good. 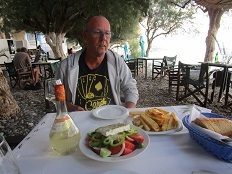 We found this restaurant somewhat pricey for Greek concepts (70 Euro in total in 2018). 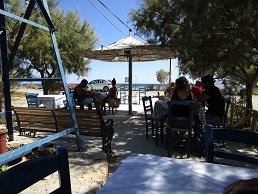 Taverna Anna is also located on the beach of Tsoutsouros. Anna is a sweetheart that tries to make everybody happy. Perhaps the nicest woman in the village. 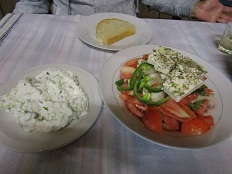 We order a Greek salad, a tzatziki, the house wine, a mousaka and a gemista (stuffed tomato and paprika). 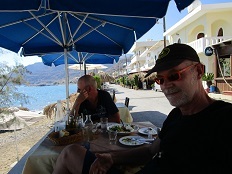 Mouratis Taverna in Tsoutsouros, in the south of the island of Crete, is situated at the beach. 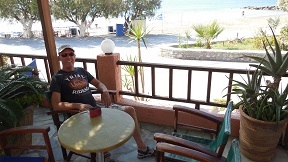 We once stayed overnight here, because on top of the taverna they rent out some very nice apartments. 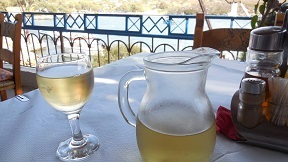 There is a small menu here with simple food and the view is off course to die for. 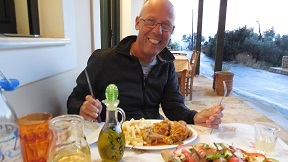 Normally we pick something like and ommetlette special (with ham, French fries, tomato and paprika), a Greek salad (tomato, cucumber, fêta cheese, paprika, fresh herbs and olives). 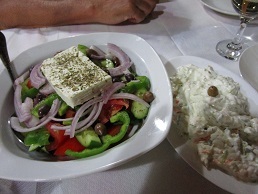 The food is good and inexpensive. 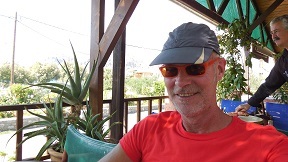 On the other hand the bread is not always fresh and there is no good coffee (just nescafé). 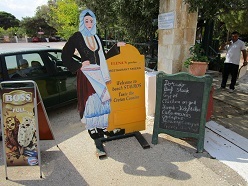 The Gefyra Snack Café is situated in the village of Vrisses on the big square with the monument on it. 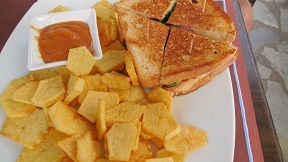 They sell snacks such as hamburgers, cheeseburgers and sandwiches. 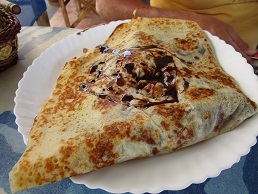 You can also have breakfast or just a cup of coffee or an ice cream. There is an internet corner in the cafe with a number of computers where it's quite busy. The breakfasts are a bit on the price, but the snacks on the other hand are cheap. 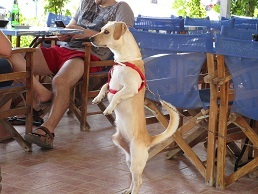 The staff is extremely friendly (a girl). 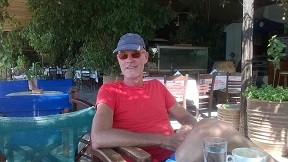 The cappuccino is excellent and served with a glass of water. The chicken burger is large and has chicken, bacon, cheese, tomato and a sauce on it. The hamburger is fine too. 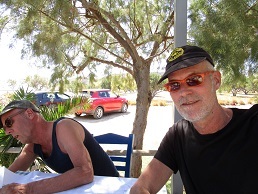 Taverna next to the main beach of Xerokampos. 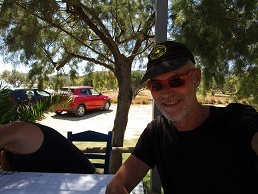 We ordered the chefs salad (beet roots, cheese, ham, egg, tomato, cucumber, lettuce), sfaka with cheese (ommelette with feta cheese), tzaziki and cappuccino. No real complaints. 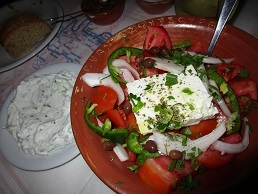 The tzaziki was a bit tasteless though and the waiter didn't make a very happy impression. 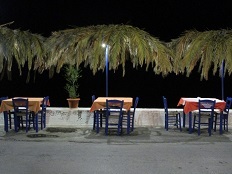 Taverna next to the main beach of Xerokampos, next to Akrogiali. 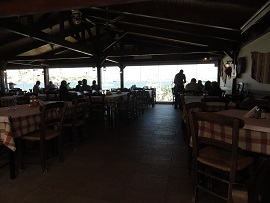 Here there is a nice atmosphere and the waiter is very friendly. 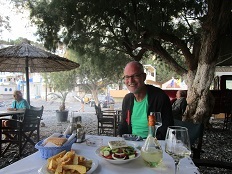 We order the soutzoukakia (meatballs), grilled sardines, a tzatziki and half a liter of wine. 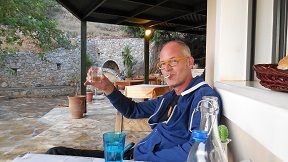 Everything okay including the wine. 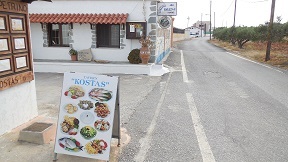 Kostas Taverna is located along the road that leads to the wetlands of Xerokampos, more in the northern part of the village. 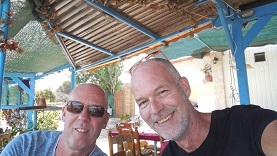 We order the spicy cheese dip, the chicken salad and the baked cheese. 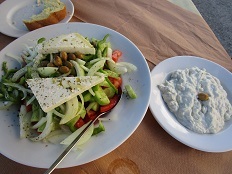 The salad was very good, with warm chicken, cheese, lettuce, cucumber, onion and dressing (a lot of dressing, but you sometimes you get that with the salads that you order in Greece). The service is friendly.